I was humbled and honored to proclaim the same message that has been preached since the first Easter in AD33: Jesus alive, Jesus killed, Jesus alive again forevermore! For over 2,000 years, the story has not changed. 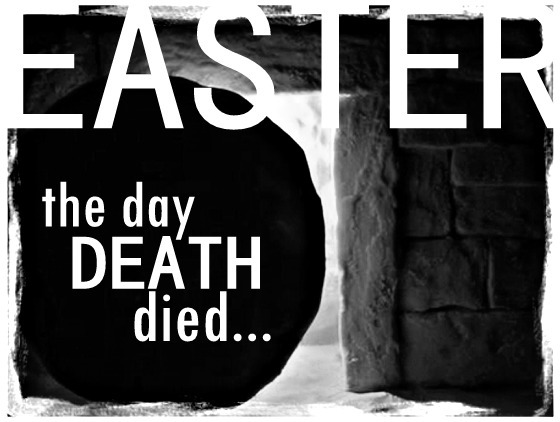 Jesus came alive and the tomb is still empty. It will be empty tomorrow too. The sermon I preached, challenges everyone to ask what “day” they live life on. Those who do not believe the gospel can’t and won’t get past Friday. This is a day in history that everyone agrees happened–even the atheists and the Muslims. This is the day that an innocent man (one who loved, served, and blessed) from Nazareth was falsely accused, illegally tried, and brutally murdered. Even if we stop at those historical facts, we can all agree, that this is a clear evidence that something is “wrong” with the world (i.e. mankind). But many of those who say they believe that Jesus was the Son of God (i.e. “Christians), even those who confess that He is the Lord and Savior, don’t seem to live past Saturday–when Jesus is buried in the tomb. Like the disciples who didn’t believe that Jesus was REALLY going to do what he said (Rise from the dead), 2,000 years later many Christians are living as if it is still Saturday. Without an empty tomb, we sit on a perpetual Saturday of disillusionment. Like the shock of the crucifixion for the disciples, a devastating loss, unrealized opportunity, or crushed dream can easily thrust us into hopeless despair. When the life or situation we had planned out for ourselves doesn’t materialize the way we envisioned (or perhaps at all), we cease putting faith in God and His promises and start putting faith in the world and the promises of sin. We want a “god” we can control…one that does it “our way”. Without Sunday we might feel like we’re in control, but we’re in act lost. We have no purpose beyond this world–so we (the self) become the center of the universe. And when that happens, our perspective is perverted, we feel judged by everyone and we judge everything–even God. This only serves to makes us fearful of the opinions of men as we try to hide whatever shame or weakness we don’t want discovered. and because this world is all there is, suffering is viewed as senseless. Pain and sacrifice, therefore, are to be avoided at all costs while pleasure and “stuff” pursued. Ultimately, death is the only thing truly assured of and, tragically, is just an end, not a beginning. We simply must live for the moment and try to be happy”…whatever that might mean. A life of perpetual Saturday is a meaningless journey to the grave. But living on Sunday, living with the deepest conviction that Jesus is alive changes everything. His resurrection proves that there is more than this life, that there is a God who loves me,, and that my job is to serve Him for as long as He gives me breath on this planet–I have purpose. His resurrection gives me perspective, allowing me to see the world for what it is–broken and cursed. Suddenly, any level”happiness” that world has to offer with dead “gods” pales in comparison to life with the one true living God. The riches of the world become meaningless and the opinions of men irrelevant the fear of the Lord overwhelms any other fears there are. This new “resurrection perspective” helps me to experience suffering differently, knowing that the worse the world can do is kill me–which will mean I get to live with Jesus face to face. When all is said and done, those who believe in the resurrection have only life…and those who do not, only death–now and in eternity. Come quickly Lord Jesus. A long time ago I understood and could almost see that I died in Christ. I was subsequently advised, that while it was nice that I died in Christ, I needed to now arise with Christ. I lost focus of this and once again hearing the fact that we have a Sunday is absolutely wonderful and brings great joy to my life. Thanks for your great message I needed to hear it.